Anyone whose ancestor is recorded as being born in Canterbury, for example in a census return, is faced with a trawl through the parish registers of the 16 Canterbury parishes: All Saints, Cathedral, Holy Cross Westgate, St.Alphage, St.Andrew, St.Dunstan, St.George, St.Margaret, St.Martin, St.Mary Bredin, St.Mary Bredman, St.Mary Magdalen, St.Mary Northgate, St.Mildred, St.Paul and St.Peter. This Index is designed to provide a means of quickly finding a particular baptism or eliminating the whole of Canterbury from a blanket search for a baptism. A search of the Index would reveal the baptisms in Canterbury of all children from a family, though these might be (and often were) spread through several parishes. Some parishes in the City were very small in area and parents could easily change parish just by moving a few streets or even a few houses. Many soldiers were billeted in Canterbury, particularly in the 1790s-1810s, and this Index is also a useful aid to finding their childrens' baptisms. The Index is compiled from original parish registers or, where they do not survive, Bishops Transcripts of parish registers. Each of the parishes is covered for the full period and there are no gaps. The registers/BTs have been checked up to 1865 (1880 in the case of St.Andrew and St.Mary Northgate) for baptisms of those born up to 1840 or those noted as being adults. All details from each entry are recorded. Baptisms of children with parents' abode given as 'Canterbury' found in the registers of parishes outside the City are now being added as they come to light. 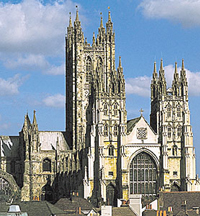 There were some 24,000 baptisms in Canterbury in this 50 year period. The parishes outside the City walls were the most populous, particularly St.Mary Northgate, which saw many of the soldiers' children's baptisms, and St.Mildred. Children of parents living at the City Workhouse were baptised in the parish church of St.Margaret and those with parents in the Union Workhouse at St.Alphage. Tradesmen and shopkeepers tended to live within the City walls and frequent the small inner city churches. Search Fee: £5 for a specific baptism plus up to 4 siblings. If the required baptism is found, a quotation for providing details of other siblings, if more than four, and possible earlier/later generations will also be sent. It may be possible to provide a photocopy of the required entry or entries for an extra charge, which will be advised when replying. Block surname or family extractions can be supplied at the rate of £1 per entry.